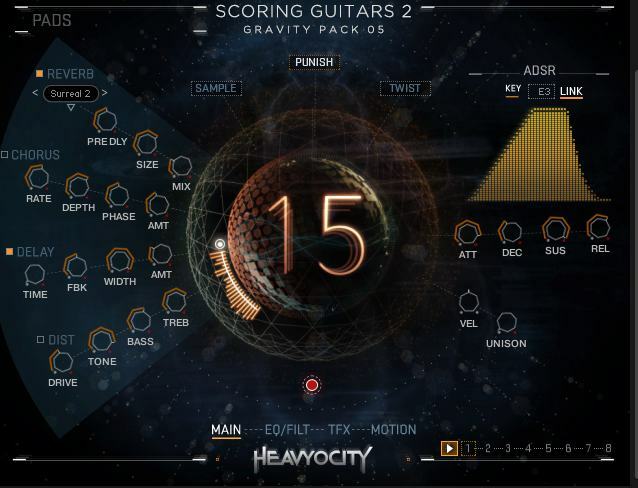 Based on their powerful Gravity engine (see our Heavyocity Gravity review), Heavyocity Scoring Guitars 2 is a library of diverse, guitar driven sounds for Kontakt. It contains over 5GB of badass guitar loops, phrases, pulses, atmospheres, pads, and more for adding some serious spice to your latest TV, film or trailer track. I’m a big fan of Gravity, not just the sounds but the way the engine works, and the interface – so I was pleased to see it carried over in this product. Heavyocity have been pumping out some really great libraries with a focus on high end tools for modern composers. I have been really really impressed with my last few purchases from them- both Gravity and the amazing Forzo (worth it for the trombones alone IMO), and now this expansion – ‘Scoring Guitars 2’. Firstly, you don’t need Gravity to run this, so good news if you’re just after guitar based sounds or something quick to spice up your latest project. It even works on the free Kontakt Player! The sample folders are split up as follows: Ambient Pads & Drones, Melodic Pulses & Phrases, Pads, Performance Palettes, Rhythmic Pedals, and Xtra Playables. Some are very guitar focused sounds – ie licks, phrases etc, whilst others (like the pads) are more ambient landscapes based on guitar sounds – filtered, with synths, and so on. On the main page there are a bunch of ways to process the sound – filters, delays, chorus, etc as well as the classic Gravity “Punish” effect which is a fantastic way to get some bite into the sound. Love it! (Punish is also available as a standalone product). From here you can access other tabs – EQ/filter, TFX, and motion. On these tabs you can really start to morph the sounds into something new – Everything is really easy to tweak, which is great for those of us who like to start playing around with the sounds before we read the manual! Overall I really like the sound of this. The pads are deep and atmospheric, as you can expect if you’ve used Gravity. The rhythms and pulses are good, and the phrases are useful if you need some quick licks etc. You can change the start time of them, and with some clever editing you can build some interesting lines and phrases, blending lines together, so they don’t get too stale or repetitive. I enjoy making pads and drones out of guitar sounds because of the organic feel they can bring to an otherwise synthetic sounding drone or synth, so I’m really pleased with this library as it contains a lot of very useful sounds for that purpose. Definitely a time saver for some really quick guitar-y sound design patches that sound great out of the box. I have put my guitar away in favour of this library on more than a few occasions when I’ve needed some quick gat action! There are some nice gritty chugs in there with various rhythmic possibilities, held chords – everything you need for a guitar soundscape in a cinematic composition. Slick, powerful sounds that are ready to rumble. It should be noted that this library is not a fully playable guitar library (nor does it claim to be), and although you can piece together some really convincing stuff thanks to the editing tools this is definitely more suitable for textures, drones, pulses etc as opposed to full on guitar playing – something I know a lot of composers are craving. It does have a couple of ‘playable’ patches but they are limited. Heavyocity has definitely heard this and It may be an area they are willing to explore in a future release. 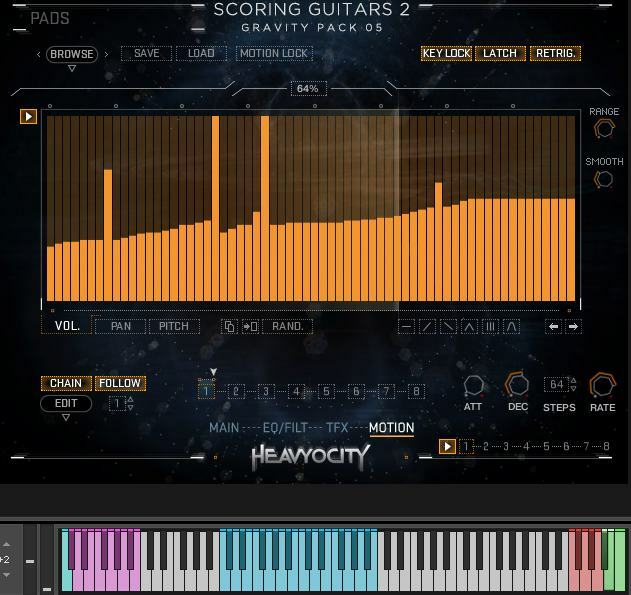 The good news is there a bunch of ways to control the sounds in Scoring Guitars 2 to maximise its use. The pitch can be adjusted with key switches and also the pitch control on the main panel, The TFX panel (where you can tweak distortion, delay, panning etc) can be triggered by the red keys (pictured above). The green keyswitches access the motion page, where you can use a preset or customise the sync/motion to your own patterns/pulses. It’s really quite flexible, and in a couple of seconds you can do a lot to a sound to make it interesting or unique. For a lot of cinematic music, you often don’t need anything too crazy when it comes to guitar – sometimes all you need are single notes, drones, plucks, deep held chords etc, and this is where the library really shines – offering media composers a range of really great guitar sounds and textures that are easy to play, program and edit. I’m really happy with this – I think it’s a fantastic addition to Gravity, and it works great as a standalone library too. If you need some licks for your crime underscore tracks, or gritty pads and plucks for an action sequence or trailer, this is definitely worth checking out. The sounds are great, the editing features of the Gravity engine provide a lot of flexibility, and its priced VERY nicely for what you get. Check it out! Scoring Guitars 2 is available for (approx.) $49/€45. Chris Hurn is a composer from New Zealand. He writes for several trailer and production music libraries, and is currently working on a couple of video game scores. His website is http://www.chrishurn.com.